The best time to repair a crack is right away! Cracks can spread and create even more damage over time. And, once a crack has had the chance to accumulate dirt, it rarely goes back together without a noticeable line. If you are in the habit of cleaning your instrument on a regular basis and notice a crack, avoid contaminating it with wax, polish or other cleaners. When applicable, small patches of wood are used as "butterfly bandages" to secure the crack from the inside. It is vitally important for you to understand the role the effects humidity has on your instrument as repaired cracks can easily reopen if the instrument becomes dry. Read more about humidity and care. Cracks that are too wide to simply be glued back together can be filled with a splint or very thin slice of wood that matches the area being repaired. 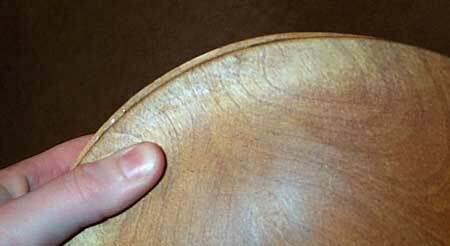 It's important that the patch be made of the same wood, as different species of wood shrink and swell differently. Gibson A-4 with cracked neck heel/block and top. Repair photo. Likewise, if the damaged area is missing wood or the wood is too severely damaged to be repaired, a patch of wood can be used to fill the hole. Yes, I see quite a bit of these unfortunately. But the damage is not always fatal. Many peghead breaks can be repaired. The method I use depends on the location and length of the break. Some breaks can render a very solid repair simply by gluing them back together, while others may dictate the need for reinforcement or replacement. I am always happy to inspect an instrument and advise you on the method I would consider appropriate but it is impossible to advise without first seeing the break. A seam is where separate panels meet and are glued together. Back to sides, top to sides, fingerboard to neck etc. When repairing loose seams it's important to remove as much of the old glue as possible to provide a clean gluing surface for the repair. Back shrinkage combined with dissented sides. 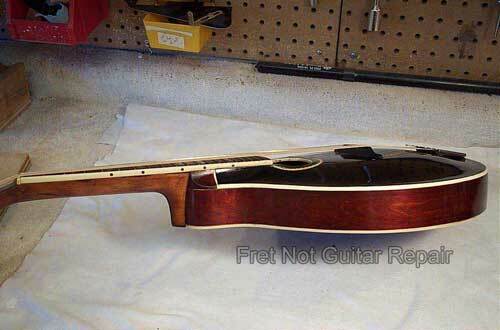 I see quite a few older mandolins open up where the back joins the sides at the tailpiece (end block). 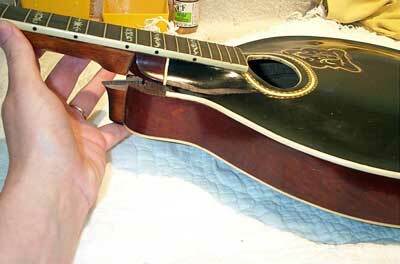 If you notice your instrument opening at a seam, it's advisable to remove string tension as continued stress to the area can cause the panel warp or open further. The sooner you have an open seam repaired the less likely the repair is to be detectable. Unfortunately some older instruments have dried out so severely that the back can actually shrink, creating a real challenge to bring them all back together again. I often describe the dilemma as trying to put a small lid on a large trash can. 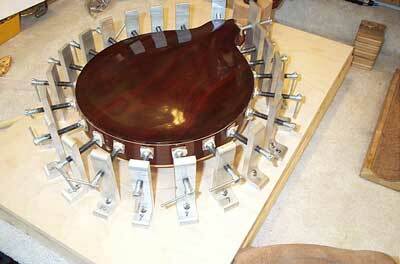 As you can see below, I made a jig that enables me to place pressure around the sides of the entire mandolin. It should be said however that only so much pressure can be applied in an attempt to "push" the side back into alignment. More moderate pressure usually results in opening seams at other points as the instrument tries to relieve pressure. Gluing jig places pressure evenly around the sides.